Devlin snuck a tiny pink robot into the house, hoping Cassiel would not notice. Since this toy was significantly smaller than the previous one, she figured she had a better shot at succeeding this time around. Her previous toy, Mr Bubbles, had not been as conspicuous, and saying goodbye to him was very hard for Devlin. “Fine, you big meanie,” Devlin stomped outside of the house. Cassiel followed her. Of course she was going to play with Rodney. Devlin also got into Cassiel’s way when she was trying to work. It was official. Somehow, Cassiel had ended up with a child in her house, against all odds, and her old age. The constant chatter and whining and attention seeking was getting on Cassiel’s nerves. She barely had any time alone anymore. Finally, when Devlin disappeared somewhere for a moment, Cassiel would be able to enjoy a nice drink in solitude. Where has that stupid clone gone anyway? Cassiel was on her own again, with nobody but ghosts of the past to talk to. Cassiel walked outside of her house, into the sun. She’d make a comeback, yet again. But everything was strangely blurry, and her body seemed to be acting slower than her brain. Like a phoenix, she thought. Suddenly, she spotted a strange shadow in the corner of the garden. “Baato?” She called out. At that moment, her body betrayed her as she fell to the ground. The shadow was getting closer, although she could barely see it for this strange purple light surrounding her. But what did it matter? “He’s returned at last,” Cassiel whispered, a single tear sliding down her cheek. But it wasn’t Baato that had come to Cassiel. It was the reaper. Only those with regrets should fear death. The house was empty now, and it seemed like a bit of a waste to not enjoy it. So the reaper lingered. Cassiel looked around her mansion. So much had been taken away from her over the years, and yet she’d always rise from the ashes, time and time again. The home surrounding her was proof of it. Now she finally had some peace and quiet. Perhaps a bit too much peace and quiet. But that was about to change soon. For now, she had some company in her thoughts. Not a day would go by without her thinking about Baato. As she grew older, sometimes she’d talk to the ghost of his memory, however faint it was. Some days, she could almost convince herself he had never left. Almost. 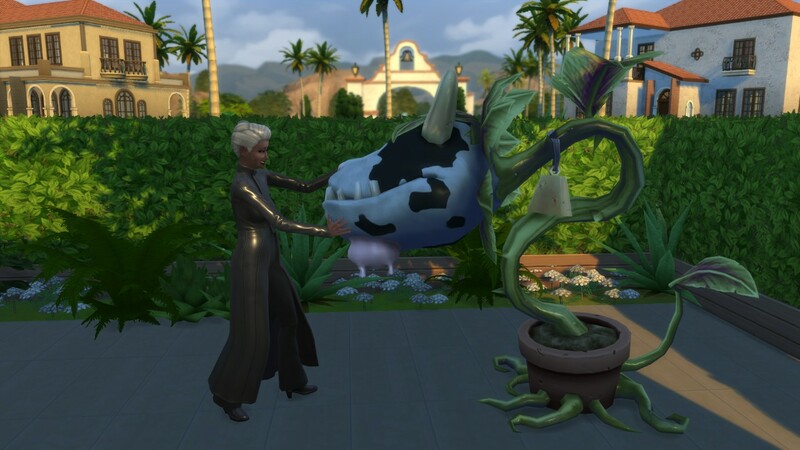 And she also had a companion in her trusty cow plant Rodney. He had been with her for quite a few years, grown from one of the seeds Baato had left behind. For the most part, though, Cassiel occupied herself with work. She may have had a picture of her daughter that she got from the employee database in her office, but it was not sentimental, she’d tell herself. It was just a reminder. A reminder of what exactly, though? They did not share a lot of past, and the girl made it clear that she did not wish to share any future with Cassiel either. A reminder that her genes have been carried over to another being? If that was the case, the future held something even more promising for Cassiel. She’d made Chell Bloomer her protégé for foolish emotional reasons, but it proved a good decision nonetheless. Chell became an invaluable employee at the lab, and the first one to create a cloning machine. Eagerly, Cassiel stepped on the machine. “I don’t think so,” Chell frowned. But there she was nonetheless. Cassiel’s clone, her mirror image, her ideal companion. Chell left, though she felt something didn’t sit quite right. Then again, she often had that feeling around her boss. It was just another day in the office. Cassiel geared her clone up in a new outfit, she wanted them to be distinguishable by something, to make it clear who the leader is. Still, she was astonished at the similarities they shared. Devlin, as a faulty clone, turned out to be good, childish and outgoing. Knowing they all only had limited time left, Peter and Lilah invited Erica and Daniel over for a small family gathering. They all chatted away about the recent weddings; Peter and Lilah gave a detailed summary of their travels and Erica and Daniel gushed about their grandchildren. “Don’t say that, Erica,” Peter frowned. Maybe she had an inkling. Peter was with his sister in her final moments, somewhat unexpectedly joined by Keiko, who was just on her way to bed. What do you say to someone who had just lost their sibling, Keiko wondered. Keiko was not spiritual, and for the most part, she’d always let her body do the talking; deep meaningful conversations had never been her forte. Still, she liked her father in law, especially after he’d been so nice to her at her wedding, and she wanted to try to cheer him up. She gently placed her hand on his shoulder. It was an odd wish, but Keiko obliged. “Of course not! She’s probably… right there?” Keiko pointed towards a constellation. Peter smiled softly. His and Lilah’s worries had been unnecessary. Booker was in good hands. With Erica gone, the Bloomers moved Daniel into the house; since he was not capable of taking care of himself. The first thing he did in his new home was watching Keiko sleep, naturally. Peter made sure to spend a lot of time with Daniel, he couldn’t (and didn’t want to) imagine how losing his spouse must have felt for Daniel. He was right. He joined Erica on that very day. He looked peaceful in his death, as if he was dreaming. I hope you and Erica have a wonderful time on the rainbow, Daniel! The only person that witnessed Daniel’s reaping was Lilah. The experience has shaken her. She knew she would follow the same suite soon, and it terrified her. She had lead such a wonderful life, but she did not quite want to leave it all just yet. 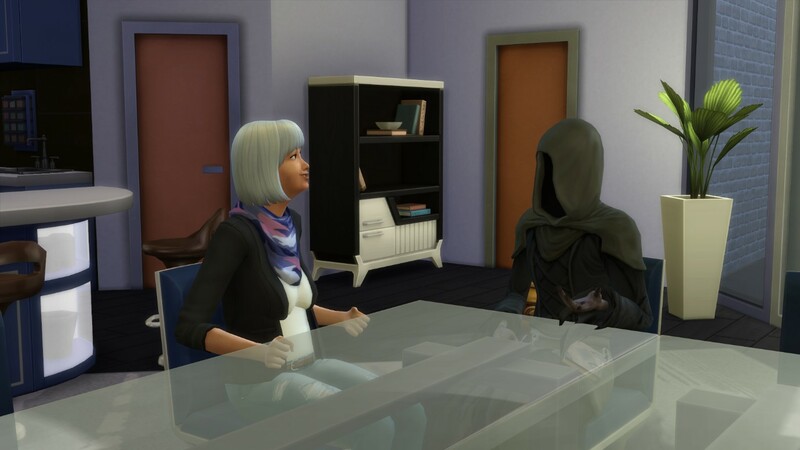 Luckily, Grim Reaper stayed behind for a bit of a chat. As Death left the house, Lilah was feeling a whole lot better. She’s done so much in her life, but the explorer in her found something about the thought of one last adventure quite appealing. And so, she feared no more. It appeared that Grim Reaper had one final stop before he left the Bloomer residence. Lured into Yenn’s quarters by the sound of the piano, he sat down and listened to her play for a moment. “You’re a talented musician,” Grim complimented the girl. Yenn looked up. The presence of death did not shock her, she knew he’d been lurking around the house. But what did he want with her? “No, the time for that will not come for quite some time,” Grim replied matter-of-factly. Keiko can barely eat any of her breakfast. Peter and Lilah were not sure what to make of their new daughter in law. But as long as Booker was happy, so were they. Since Keiko wanted her wedding to be unique, the wedding took place on the roof top terrace. But the, erm, blushing bride does not seem to care one bit. I must admit she scares me a tad right now. Are you sure you don’t want to change your mind, Booker? The does ceremony go ahead, and it’s lovely… for the most part. The guests watch the pair’s first kiss as a married couple with mild enthusiasm… To the free bar! “I love that there’s so few people and so much space… this is my kind of wedding,” Yenn proclaims. Over at the bar, the “party” continues. At least Knox is dancing… then again, when is Knox not dancing? “Thank mom, but this is so innapropriate,” Chell whispers. Peter looks at his daughter in law. It seems just like yesterday when his very own bride was upset about her wedding day being disturbed by grim reaper’s appearance. The newlyweds retreated to the sauna. Booker was still somewhat torn about it all, but he didn’t want Keiko to be upset today of all days; when she finally got what she wanted. And besides, the part Booker had been looking forward to has just started. The honeymoon! 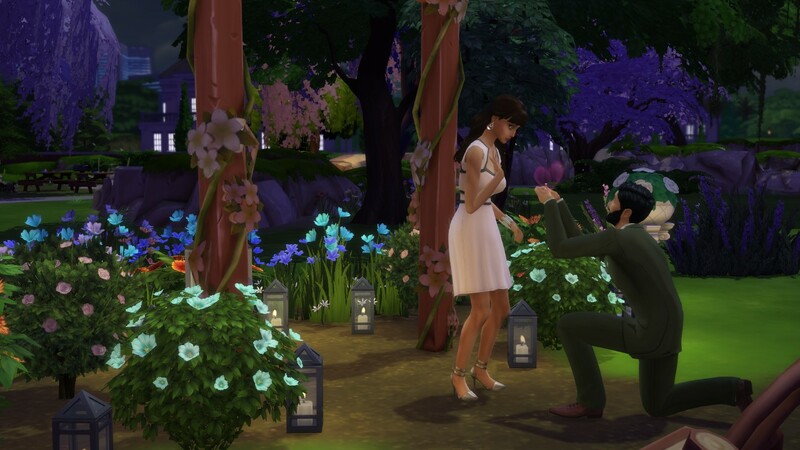 The Bloomer Legacy: 4.10 What Happens After Happily Ever After? After Keiko’s outburst at the wedding, Booker approached Keiko the following day. Who better to ask for love life advice than the newlyweds. The way they said it made it sound so simple, but what they were saying seemed far from it. Then again, this was Booker’s parents. He could see their relationship, the stable rock that couldn’t be threatened by anything… They’ve probably never faced any major relationship doubts, Booker concluded. Yenn: “Are you serious? What are you asking ME for? It was true. Things between Ethan and Yenn were rather rosy. She’d been spending many of her evenings over at Ethan’s little house, happily forgetting about everything else. Was this man even real? Yenn felt so comfortable with Ethan she eventually had her first woohoo with him. And while she didn’t have any comparison, she thought it was quite spectacular. She smiled to herself as she prepared some pancakes for breakfast the next morning. For the first time in a long time, she wasn’t feeling tense or antsy or unsure. She was just… happy. If the most non-committal person he knew was suggesting that he should take a risk, so be it. Booker took the plunge. Keiko was materialistic, childish and an attention seeker. But in spite of knowing all that, Booker didn’t want their relationship to end. And there he had his answer. Yenn stood over the tombs of her ancestors with quiet appreciation. These were the remarkable people of generation 1 and 2 who had shaped the legacy in its beginning. It all started with Kirk and Maranda, the founder couple who slept in a hut, built the park, and brought Ruby back to life. To Yenn, Ruby was the one who tied it all together. She changed the generation 2 heir Isaac when he was a child, and then she changed him yet again when he grew up into a young man. She was the one who made him the worthy heir he was. And of course, Ruby was also related to Yenn twice over; she was her great-grandmother through the Perrin line and her grandmother through the Bloomer line. It was now time for another Bloomer wedding; although not long till Chell will become a Mrs Hankins instead. Yenn had the old home of generation one and two converted into a wedding venue specifically as a wedding gift to the newlyweds, but her reasoning behind creating the new venue was twofold: Not only was it a place to celebrate the current and future Bloomer unions, it would also become a place to celebrate the Bloomers past, commemorating the deceased family members at the cemetery at the back. Bringing the family together in more ways than one, Yenn thought. But perhaps that was too morbid of a thought for a day like this. The rest of the Bloomers were here already of course, eager to celebrate. The Agustins start arriving shortly after, and as you can see, they now have offspring! The girl in the pink dress is Alice, Skylar and Audrey’s daughter. She doesn’t seem happy to be here! Liam, Amos and Jenny’s son, on the other hand, is having a great laugh dancing with Keiko. As a childish sim, Keiko is enjoying the company of the kids the most. Finally, I think there’s no need to say whose daughter the girl in the blue dress is, Josephine looks so much like her mommy! But let’s turn our attention to those who today is all about and gather around for the ceremony. As for Peter and Lilah, they couldn’t imagine a better place to be. Introducing Mr and Mrs Hankins! Let’s get this party started! By the looks of it Keiko has had just a tiny bit too much to drink. In fact, I haven’t seen her without a glass in her hand all day! As the day progresses, she continues to get angrier and angrier. “Why are you not paying attention to me?” she yells at Booker. “You are… so lame,” Keiko slurs. Very mature Keiko, very mature. Elsewhere, Peter and Lilah are oblivious to their son’s relationship drama. And as for the newlyweds, it appears that all of the women at the party are swooning over Knox’s magical proposal story. Yes, you’re right ladies, he’s a catch and Chell knows it! Yenn is not sharing the enthusiasm of the other wedding guests. As much as she’s enjoyed celebrating her sister’s big day, she’s gotten to the point where she can no longer handle being around all those people. She’s joined at her most remote table by Kaylan and Amelia. Amelia was right, by sun down, the guests were worn out, and aside from the overjoyed newlyweds, there was almost no one left at the lot. With no people around, Yenn was finally at peace again, able to get lost in her thoughts. She stayed back in the garden even after everyone else had left. Seeing her sister so happy moved something inside of her. Her whole body started moving ahead, even before her mind had made the decision. She was running, no, she was flying. Puzzled, Ethan wasn’t sure if he should laugh or worry. Before he could decide, Yenn grabbed his hand. 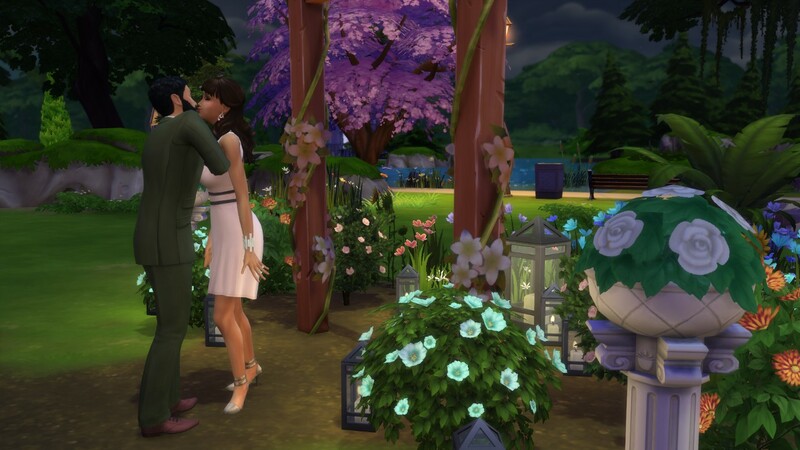 The Bloomer Wedding venue/cemetery can be downloaded here. Chell was feeling accomplished. She had a productive day at the lab, she was finally able to finish building her rocket and to finish off the successful day, she started on a wooden sculpture. She loved her life. She was just about to go to bed as her phone rang. Chell was confused. Knox was not spontaneous. What could be going on? She quickly got changed and headed across the street. The park seemed empty. Where was he? And then she spotted him. Chell laughed. But before she could reply, Knox dropped down to his knee. Even Booker and Keiko can’t beat this! We’re coming home! Congratulations on your engagement. Knox is a wonderful man, and we know he’ll make you happy. We wouldn’t miss your wedding for the world! When Peter and Lilah returned, they made a brief stop at the Agustin house first (made all the more brief by the fact Daniel was insisting on only wearing his underwear). They’d all gotten so old, but Peter and Lilah didn’t feel old; they felt refreshed and full of new experiences. But the one they were about to embark on was going to be even better; their firstborn getting married! Keiko was nervous. She wanted to make a good impression on Booker’s parents; while Booker had always proclaimed that the legacy is his now, it seemed like there was a shift in the dynamics of the house once Peter and Lilah had returned. They spent the rest of the night talking, laughing and sharing. Together as a family, once again. What an epic adventure! Booker started his new job as a team mascot soon after his birthday. He did sweat a lot in the llama costume, but the career path of an athlete can’t be expected to be sweat free. Keiko also started working, she became an office assistant for a major firm based nearby. She dreamed of running her own business someday. Her and Yenn usually got home around the same time, and while they were not close, they’d always exchange a few friendly words upon their return. In spite of herself, Yenn actually felt quite grateful for the human contact she got at home, because her colleagues still refused to talk to her at the lab. She quite liked the balance, time to herself to recharge in the office as the projects got more and more interesting, and time to socialise with her family. But one day, as she was analysing a death flower through the miscroscope, she suddenly noticed she had company. As the girl with the golden hair walked into the room, Cassiel couldn’t take her eyes of her. She’d been watching her through the security cameras ever since the day she had started, but to see her in flesh was a whole new experience… she looked so much like her father. “Please, sit down,” Cassiel said dryly. She wasn’t quite sure how to continue; it had taken her quite some time to even muster up the courage to invite the girl over to the office to talk. But what was there to say? They sat in silence for a while, Yenn growing more and more impatient by the minute. Was she in trouble? Did she mess up any of her tests? What was going on? Yenn looked at the woman. She looked nothing like her mother, the fair adventure loving gentle woman she grew up with. If anything, she was the polar opposite; dark, closed off and hardened by life. “I don’t… you… why did you give me up?” She blurted out. Yenn’s throat felt dry. The woman’s eyes were cold, and so were her words; but at least she was honest. “Tell me about my father,” Yenn continued. “I’m afraid not. As I said, all I know is that he returned to the group of people he called his tribe, to do as they say. I don’t know what came of him after. He used to be gardener there, so perhaps he returned to his original duty. Or perhaps he was chosen to provide an heir to their legacy, in which case…” Cassiel’s voice sank. Yenn stood up and headed for the door. As she approached it, she took one last look at Cassiel. Yenn stomped out of the facility, leaving it behind. She never wanted to see that awful woman again. It was bad enough knowing she was the one who gave her life. She wandered around aimlessly for hours, unsure of where to go. She couldn’t talk to her sister Chell, or anyone in her family, for that matter. Working at Future Sims Labs was the job of Chell’s dreams, she couldn’t possibly ruin that for her by telling her about her biological mother. No, it had to stay a secret. But for once in her life, Yenn did not want to be alone. There was only one other place she could think of going. Yenn told him everything. All she’s ever known about the parents, and the awful things she’d learned today. Ethan jumped in: “First off; you’re nothing like your birth mother. You know that. Just the fact you’re getting so worked up about this goes to show there’s more goodness in you then she’ll ever get to experience. As for your father, somehow he had the foresight of knowing how amazing you’ll grow to be, he must have been an insightful and intuitive man. I’m sure that on some level, he knows what a wonderful woman you’ve become and is proud of you, no matter where he is. Ethan cooked delicious garlic noodles and entertained Yenn for the rest of the evening, telling her light-hearted stories about the trials and tribulations of his football team and the latest happenings around the library. It was a very one-sided conversation, but soon enough, there was a hint of a smile on Yenn’s face. When Yenn was finally ready to head home, she was feeling a lot better, and eternally grateful to Ethan for his kindness. “It’s all good. You looked like you needed a friend. Maybe we could give that a go instead, unless friendship is too much of a commitment for you,” he winked. Keiko has become somewhat of a permanent fixture over at the Bloomer residence. She flirted and schmoozed her way into Booker’s life and used his raging teenage hormones to make sure she never has to leave. In spite of being the youngest of the Bloomer siblings, Booker was the first one to go all the way with a romantic partner, and he was hooked. His life now almost exclusively revolved around finding the next spot for messing around. Luckily for him, it seemed that the Bloomer home was riddled with excellent locations, and lacked a parental presence to oversee them. Maybe Chell would be pleased he expressed an interest in her telescope? And one must not forget about the steamy options in the sauna. Keiko knew she played her cards right. Booker was the king of the castle, and she was his queen. It was only a matter of time till she would rule Newcrest with him. Meanwhile, Chell’s relationship with Knox couldn’t be any more different. Perhaps there wasn’t much of that lust Booker seemed to be experiencing, but Chell felt fulfilled nonetheless. She could have several hour-long discussions with Knox, debate philosophy and star constellations, the universe and the meaning behind it all. With the occasional dorky joke thrown in. Maybe they did not feel the need to constantly throw themselves at each other, but Chell knew what she and Knox had was real. She also never forgot about her other passions; she experimented with the woodworking bench, spent long nights using the telescope the intended way and she even started building her very own rocket. On the other hand, while Booker had always been athletic and eager to jump into any kind of sporty activity, these days his only physical activities involved Keiko. When her and Booker’s birthday came around, Keiko pulled out all the guns and squeezed into the most flattering dress she owned. Tonight was the big night! Side note – Hooray for all the Agustin love going on in the background! Booker sparkled into young adulthood with ease, just the way everything seemed to have come with him so far. Maybe the previous generations had to work hard, but he already had it all going for him; Booker gained the self-assured trait. Next up was Keiko with her very pink cake, joining her boyfriend as another self-assured young adult. The party was still going strong, but the Bloomer sisters were exhausted, so they bode their goodbyes to the Agustins and went to sleep. As for Booker and Keiko, well, they did what they knew best. We’re really sorry we couldn’t be there for your birthday, we’ll definitely have a belated celebration when we get back! We already bought you a present here in Shang Simla; it’s a board breaker and a training dummy for martial arts, right up your alley! Your mom and I also went to see the Terracotta Army, it’s really impressive. Did you know every soldier is different? Tomorrow we’re headed for the Dragon’s maw, there’s some interesting folklore connected to the place. The local legends are fascinating. We hope you guys are doing well, and are excited to see you enter young adulthood. It feels pretty empowering, doesn’t it? 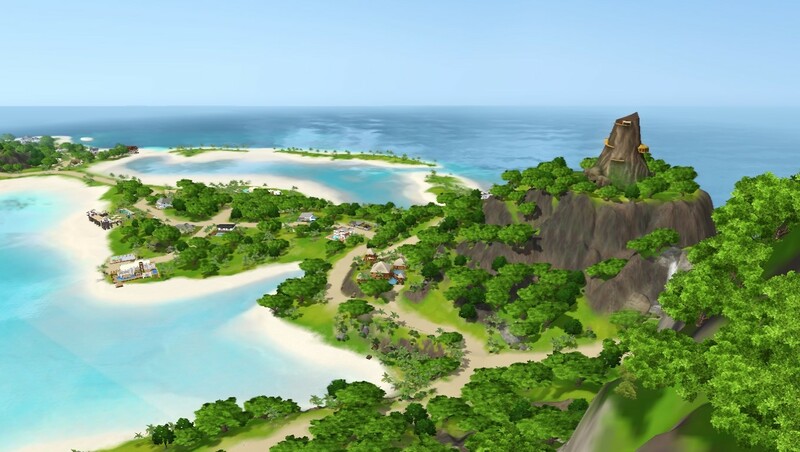 Yenn ultimately decided to accept the job at Future Sims Labs. Although the reasoning behind the offer remained unclear, it was too tempting to reject a job that would offer her so much mental stimulation every day. She looked around the vastness surrounding her. 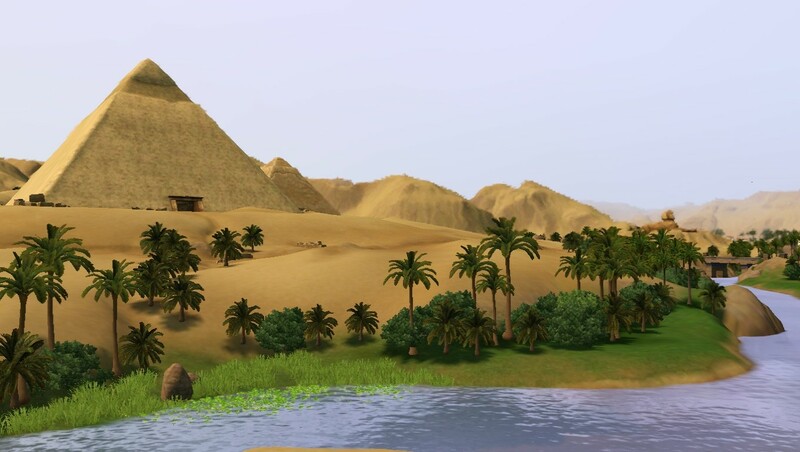 It was the first time she had left Newcrest that she remembered, and yet from the only picture she had of her parents, she knew she had been born in the desert, probably not unlike this one. In a sense, it felt like coming home. “Um, I’m Yennefer Bloomer, here for orientation,” she introduced herself nervously. “I know who you are,” the receptionist said coldly. “You and your sister are the ones who get preferential treatment from the big boss, aren’t you? All of Yenn’s new colleagues seemed similarly stand-offish, and Chell was caught up in her top secret cow plant mutation research so Yenn didn’t even see her around. Still, it didn’t matter much to her if the people around din’t want to talk to her, in fact, she welcomed the fact that her only conversations were the ones she held with the Invention Constructor. And even those discussions could put her on edge sometimes! Still, when Ethan called towards the end of her work day, she felt happier to hear the sound of his voice than she’d like to admit. He asked if she was still up for that cup of coffee, and she nervously agreed. Her heart was pounding as she approached the library café. Yenn: “My brain is no mystery! It just works slightly quicker in certain aspects, and not at all in others! Most people work that way. Ethan: “Please don’t destroy me at anything athletic, I don’t know if my ego could take that! I am trying to make a living as an athlete, after all! “Told you I was going to win,” Yenn beamed. She really wanted to kiss him. So this is what the expression butterflies in your stomach is all about, Yenn thought. Electricity. Feelings. Connection. And then you get married. Have kids. Get old, fat and grey. Get sick of each other. Have regrets. And before you know it, your life’s over. Ethan just stood there, looking amused. Yenn wanted to listen to him, but her whole body felt frozen. She already saw herself in a coffin, with a eulogy that read a loving wife… and nothing else. Suddenly she felt her legs again. Blood finally seemed to be pumping into them and she could move. She could run. Far from here. My hair might be going gray, but my bones feel young! We rented out scooters and drove around the pyramids, it was fabulous! I think even your dad enjoyed it. Congratulations on your new job Yenn! I hope Chell showed you the ropes, now that she’s a big shot Technological Innovator. I can’t believe Booker already has that post of a Team Mascot lined up for him as soon as he ages up; you have to thank your friend Ethan for putting a good word for him with his coach.